While it is unclear whether writing has made us unable to recall things from memory, or Google is making us dumber, there are skeptics who argue that the rapid advances in media are making us less politically active and knowledgeable. One outspoken author is Markus Prior, who wrote “Post-Broadcast Democracy: How Media Choice Increases Inequality in Political Involvement and Polarizes Elections.” He claims that due to the wide range of media options available today more people are opting to ignore politics, leaving only partisan voters and an increasingly polarized system. The argument hinges around the idea of a “floating voter” or those voters who are not strongly affiliated or persuaded by a particular party and “seldom approach an election with a firm sense of whom to vote for and do not always vote for the same party.” Some argue that it was the “floating” youth votes which swept Obama into office in 2008, but returned to their traditionally low participation rates during the 2010 elections when the Republican’s took back the House. The rise of new media sources allows people to selectively consume news that interests them or not watch news at all. In recent years the number of people tuning into the nightly news has declined greatly. Figure 1: A decline in news consumption with the rise of internet sources allows people to selectively consume news that interests them or not watch news at all. Prior explains that these voters tend to be less politically aware than their partisan peers, and as such they can be strongly influenced by elements like “candidate images or the controversy of the day.” Knowing about these controversies and seeing the images was inescapable back when a nation tuned into watch to the same newscast by Walter Cronkite each night. However, today we have a variety of options to distract ourselves from the news, be it a rerun of “Two and a Half Men” or the Facebook’s status updates on the daily trials and tribulations of your closest 423 friends. Prior’s Washington Post article points out how “today’s media users seek out the content they really like. Unfortunately… few people really like the news.” This means that those uninformed citizens who are not invested in politics can remain removed from the political sphere. Prior argues that this detracts from the overall participation in an election— Why move your attention away from the most recent American Idol episode or your Twitter if you don’t really care about the elections at all? This may not be a uniquely American phenomenon: a Washington Post article from June 13th reports that the media freedoms we’ve become so distracted by in the United States may be just as distracting in countries like Iran. Thomas Erdbrink’s “In Iran, ‘couch rebels’ prefer Facebook” describes how the same people who led the infamous ‘Twitter’ Revolution in 2009 are now “playing internet games such as FarmVille, [and] peeking at remarkably candid photographs posted online by friends.” The YouTube video “Tehran Persian Nights” is a compilation of these photos, and illustrates the glamorous lives of this younger generation, with blonde women without headscarves shopping in high end boutiques, and young men and women going night-clubbing in high heels and fancy jeans. Jinoos, a 39 year old Iranian artist, described her generation as “couch rebels,” and told Erdbrink that “our world online is like an endless party with no rules, and that keeps us very busy.” Some of the reluctance to participate openly in politics may be attributed to the “ferocity of the government crackdown that followed the protests of 2009” which has had long standing effects, including curbing any real outcry from Iran during the recent wave of revolutions in the Middle East. Facebook continues to be the tool of distraction, despite the restrictions implemented by the Irani regime. On a more positive note, there are many ‘techno-optimists’ today, especially on the tail end of the Arab Spring where social networks are given a lot of credit for organizing protests against authoritarian regimes. Undoubtedly, the tweets which organized protests and found their way to Al Jazeera, and to an even wider audience internationally, played a key role in the Egyptian and Tunisian revolutions. Perhaps the future of society with social media isn’t quite as bleak as we pictured it. People are rioting for freedom and democracy, and the youth of the United States has proven that they can and will mobilize for a candidate and cause they believe in. All good things, right? Maybe not. Voting and protesting are inherently different elements of political participation, and some wonder if perhaps social media is simply good for revolution, but bad for democracy. While resident techno-optimist Clay Shirky certainly sees the benefit of social media for both, saying that social media tools overall “probably do not hurt in the short run, and might help in the long run,” there are a fair few skeptics who feel otherwise. Prior clearly outlines the potential drawbacks of new media for politics, and pundits like Dave Parry point out that while social media can enable revolutions it “doesn’t necessarily mean that they enable the installation of stable power structure.” He also looks at how social networks are by nature unorganized and without a hierarchy and a clear leader there may be issues post-revolution with a power vacuum. Parry uses Egypt as an example of this, where citizens were concerned with the possibility that the Muslim Brotherhood could come into power in the event of a quick election after Mubarak’s departure. Overall, it remains to be seen what role social media is going to play in our lives. 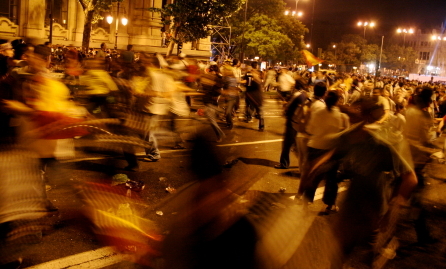 Some dispute the role it played in the Arab Spring; some argue that it caused the world to change with a hashtag. Whether or not you see it as a way for people to simply socialize or organize for lasting change, new media has had a lasting impact on the way people have come to communicate. The trick is to sift through all the #nowplaying’s and #justinbeiber’s for the salient, world altering patterns and information. No one saw the rise of Facebook, many still do not understand the nature of Twitter, and few could truly say how it will impact our lives in the years to come, but with the most recent events there may be hope for those techno-optimists yet. Elena Johnson is studying American Government and Media at the University of Virginia. She is currently researching social media and regimes at INSS and is also working for the Executive Office of the President. Last summer she worked at Women and the Environment Organization (WATEO) helping to organize educational programs for women in rural Iraq. For the United States, any consideration of Persian Gulf security must begin with Iran: its ambitions, perceptions, and behavior. For many in the West, Winston Churchill’s famous quip about the Soviet Union—being a riddle wrapped in a mystery inside an enigma—could apply equally well to Iran given its complex, opaque, and often turbulent politics. And yet the key to understanding Iran is to figure out what it sees when it looks in the mirror. 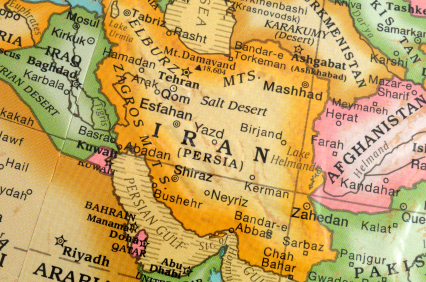 What are the fundamental influences that shape Iran’s view of its role in the world? The first, clearly, is Iranian nationalism. It is a means of unifying society while assuring territorial integrity and political power. The second is Islam, which is the country’s source of faith and ethical code. The third is Persia as the basis of its historical identity and cultural pride. Taken together, these factors and the aspirations they embody—to secure Iran’s territorial and political integrity while gaining acceptance of the regime’s legitimacy and the country’s status in international relationships more generally—are deeply rooted in Iranian society. But there is also a fourth, latter-day imperative that wields great influence over Iranian attitudes: the quest for strategic self-sufficiency. Everywhere they look, Iran’s leaders see their country encircled by real and potential enemies—by Iraq, which used chemical weapons and missiles against Iran in their 8-year war; by the Gulf Arab states, which financed the Iraq War, host the U.S. military presence, and are seen as repressing their Shia communities; by Pakistan, which is occasionally involved in hostile skirmishes with Iran on their common border and has encouraged anti-Iranian activity in Afghanistan; and by Central Asia, once pro-Soviet, now a source of economic opportunity, sectarian risk, and host to U.S. military forces. Above all, the United States, a virtual neighbor since the occupation of Iraq in April 2003, and Israel are viewed as enemies: both threaten Iran’s nuclear achievements and deplore its efforts to derail any peace process between Israel and the Palestinians or Israel and Syria. Washington, in particular, is seen as keen to keep the Persian Gulf as its militarized zone, maintain pro-U.S. regimes in Baghdad and Kabul, and marginalize Iran. Iran’s leaders—whether moderate Persian nationalists or conservative Islamists—view the world with a mix of confidence and trepidation. Regardless of where they stand on the political spectrum, they most likely share a common view of the threats to the homeland and the measures necessary to protect Iranian interests. This consensus also includes a strong, underlying sense that they may well have to fight alone, again—just as they did from 1980 to 1988—and that Iran must be able absolutely to defend itself without assistance. Thus, Tehran aspires to independence and self-sufficiency in both strategic and operational terms. It believes that it must build its own military industries, reconstitute a modern military force, and have minimal reliance upon foreign suppliers. It also seeks to acquire nuclear technology and, eventually, the wherewithal to produce nuclear weapons, probably as a cost-effective way to compensate for military weakness and relative strategic isolation. The predicament that all this poses for Iran’s neighbors and the larger international community is not only how military self-sufficiency is defined by Tehran, but also how this self-sufficiency impulse plays into an already strong sense of Iranian exceptionalism—specifically, that the country is endowed with the natural right and historic destiny to dominate the greater Middle East as well as to lead the world’s Muslims. Iran’s ambitions to be the preeminent power in its neighborhood are longstanding. The quest for regional hegemony began under the shahs and has been continued by the clerics of the Islamic Republic. Iranian foreign policy has always been designed to protect a nation and an empire that were long coveted by more powerful neighbors—Ottoman Turkey and tsarist Russia—and divided into spheres of influence by the great powers of the 20th century—the Soviet Union, Great Britain, and the United States. Viewed through this historical prism, these ambitions have little to do with exporting its Islamic revolution or expanding its borders, although occasional reminders to the Gulf Arabs of the Shia and Persian-origin communities within their borders prompt those Sunni Arab–led states to recall their vulnerability. Iran wants to expand its influence and authority in the region, but it is not interested in territorial expansion. Rather, it seeks to build its clout through a policy of aggressive outreach short of war—by building and backing support networks throughout the region; providing political support and economic assistance to key actors; bolstering trade and commercial ties with neighboring countries; and signing security and defense agreements. In implementing its policies, Iran operates on two intertwined principles that underwrite its ability to build networks of surrogates, intimidate opponents and critics, influence governments, and make foreign policy: the first of these is plausible deniability, and the second is deliberate ambiguity. The document in its entirety may be found here.